The introduction of MST makes Samsung Pay a universal solution that is compatible whether the checkout terminal supports NFC or the traditional mag-stripe found on debit and credit cards. Samsung says this means the payment service could be accepted at 30 million merchant locations worldwide. Samsung Pay is a mobile payments service that allows secure mobile payments to be made at participating shops and points of sale. 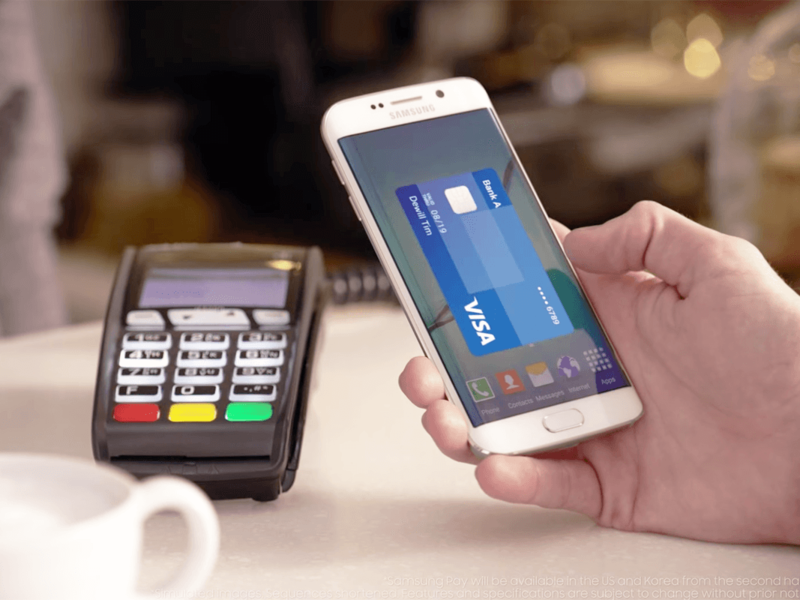 Samsung Pay combines NFC and a new Magnetic Secure Transmission (MST) technology to allow you to make payments using your Samsung Galaxy S6 or Galaxy S6 Edge, plus forthcoming devices including the Gear A smartwatch, Galaxy Note 5 and Galaxy S6 Plus. It has already partnered with Visa and Mastercard on the project, and is working to get major banks involved. Samsung Pay will reinvent how people pay for goods and services and transform how they use their smartphones. The secure and easy payment process, coupled with our robust partner network, makes Samsung Pay a truly game changing service that’ll bring value to consumers and our partners in the ecosystem. Payment security is also provided by Samsung Knox and ARM Trust-Zone, which work together to prevent fraud and data theft. Samsung last week confirmed that it had extended its Mastercard partnership to Europe, having previously trialled it in Korea. It says it takes only a few steps to add a card to your Samsung Pay account, and using your phone to pay for goods and services is then simple, fast and secure – more secure than carrying a credit card in any case, with no account numbers held on the device and all sensitive data replaced with unique tokens. For now Samsung has not provided an exact release date for Samsung Pay, but it has said it will come with its next big new device. That means the Gear A, Note 5 and S6 Plus, which are expected to launch at an Unpacked event on 13 August. Samsung Pay will also be available on the Samsung Galaxy S6 and S6 Edge. Samsung says it will be available in the US and Korea from the summer, and will roll out to the UK, Europe and China thereafter.